We have a dedicated team here to help you make the right decision for your future. Profile can finally confirm that we have won the recent Apprenticeship tender competition with Kent County Council. We are now the sole training provider offering and delivering the new Level 3 Teaching Assistant Apprenticeship ‘Standard’, county wide for all KCC maintained schools. We are really proud of this achievement and are really happy to share this amazing news! For further information about the Level 3 Teaching Assistant Standard please click here. The March Equality and Diversity Newsletter has been published. Here at Profile we have partnered with KM Digital Solutions so we can get the word out about our Level 3 Certificate in Supporting Teaching and Learning in Schools. 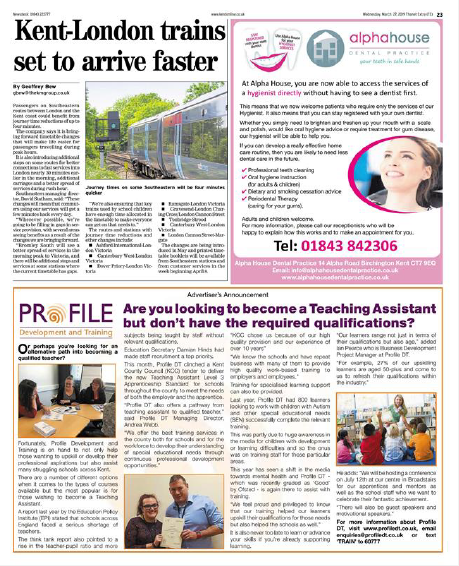 We think the course is brilliant and will give you the opportunity to become a Qualified Teaching Assistant. Please visit the website, give us a call on 01843 609300, text TRAIN to 60777 for some further information and tune into kmfm to hear our advert. The January Equality and Diversity Newsletter has been published. This course is ideal for learners who wish to improve their knowledge of data protection and data security. Understand current data protection legislation. Understood organisational procedures concerning data. Understand threats to ICT systems and data. Understand the consequences of not protecting data. Please note this is an online course and workbooks are for reference only. As a fully funded course we cannot offer Understanding Data Protection and Data Security as a paper-based course. Upon successful completion of the course, you will be awarded an NCFE Level 2 Certificate in Understanding Data Protection and Data Security. For more information on this course, including mandatory units and credits, please look at our FAQs. Please note a fee of £204 (inc VAT) is payable if learners decide to withdraw from the course and do not complete their assessments. If you are interested in finding out more about the course, please complete the Expression of Interest or Contact Form below and one of our dedicated staff members will be in touch. After months of planning, we finally got ‘that’ call. I have to admit, my heart sank a little bit, having never been through an Ofsted inspection even as a secondary school teacher (I’m not sure how I managed to dodge them!). I do remember, though, the panic and mayhem that went into the preparation. Yes, I was still a little worried, hoping that our preparation had paid off, but not quite knowing how rigorous and formal it would be. However, none of this last-minute cramming into the early hours or being called into work for the entire weekend. Oh, no. We had this! The inspectors arrived on Tuesday morning at 8.30 on the dot and had their initial meeting with our Managing Director. Then it was my turn. I did mention that perhaps I ought to be a bit more nervous and scared but there was really no need to be. You couldn’t have met two nicer gentlemen who quickly put me at my ease. Then the questions started flowing. Thank heavens for all that preparation. As the Centre Manager, the majority of the inquisition fell to me. Now, I’m not the most confident person you’ll ever meet, and I do doubt myself quite often, but the whole Ofsted process gave me a real boost. I found that I was able to answer all their questions and quickly locate any evidence they wanted, right there on my laptop. As the days went on, I found it to be an empowering process; I definitely knew everything I should and was able to talk about the company and its learners confidently. By the end of the process, I felt really good about myself and the work that Profile are doing to open doors to a better future for our learners. During this course, you will learn what is meant by Information, Advice or Guidance and how to apply these within their own context. As a fully funded course we cannot offer Information, Advice or Guidance as a paper-based course. Upon successful completion of the course, you will be awarded an NCFE Level 2 Certificate in Information Advice or Guidance. Thank you for all the cards and festive wishes we have received. 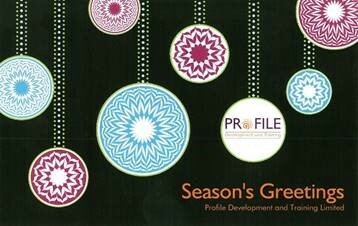 Each year PROFILE make a donation to a Charity instead​ of sending out Christmas greeting cards. This year our chosen charity is A Bear Named Buttony. Buttony is a special bear for children having surgery to create an ostomy. Their uniquely personalised bear is designed with a similar surgery as each child and the charity group, A Bear Named Buttony, hopes that these bears can offer comfort and friendship to children all over the UK. There is nothing better to focus your mind on your training business than an impending first Ofsted inspection. This is what happened about 8 months ago. We knew we were in scope for an inspection so felt we needed to plan for it. My wish for my staff was that when the call came, we would be in a position to say, “bring it on”. I’m pleased to say this was exactly what happened, and it turned out to be the most positive experience myself and all of my team have had. This was down to a number of reasons. But how did we get ourselves into this position? We started to plan by looking at the Common Inspection Framework (CIF) and identifying what provision looked good and outstanding. We then looked at other good and outstanding reports to identify what Ofst ed looked at in practice. We also worked with an ex-inspector who carried out a mini inspection on our delivery evidence. After we had carried out these exercises, we were able to come up with an Ofsted action plan, where members of the management team were tasked with gathering and checking evidence to ensure it was effective at meeting the CIF. Another activity we felt was important was to engage with some Ofsted Nominee training. The Centre Manager and I attended the training in London, which fully prepared us for the job ahead. After the meeting we were able to add to the Ofsted-ready plan. By the time September arrived we felt confident that we were a very ‘Good’ provider and we could evidence this through all aspects of our provision. It was through the effective planning and preparation we had carried out that made sure we were fully prepared for the visit and looking forward to shouting about it. Therefore, the key to a successful Ofsted inspection is Preparation, Preparation, Preparation.